Last night was a huge first for me - I went to my first ever blog event! 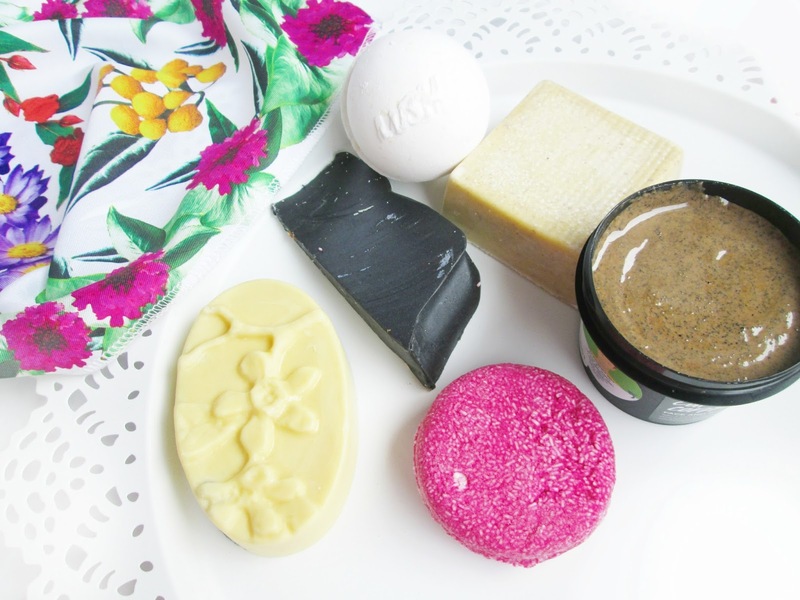 To make it even better it was with my absolute favourite skincare brand, LUSH. I was so excited when I received an invite to the event at the LUSH store in Sheffield, and rightly so, I had an amazing time. The first activity I took part in was finding my perfect LUSH perfume and discovering my Emotional Brilliance. The fabulous assistant, who had awesome matching blue hair and blue lipstick, asked me to describe my perfect moment and all the scents that would be around me. I told her I would be having a picnic in a beautiful field full of wildflowers, wearing a flowing dress. Based on this, she recommended for me the perfumes Karma, Kerbside Violet and Death & Decay. The latter sounds a bit grim, but it is actually the most beautiful, sad mixture of lily and jasmine which gives a powerful, dreamy scent. 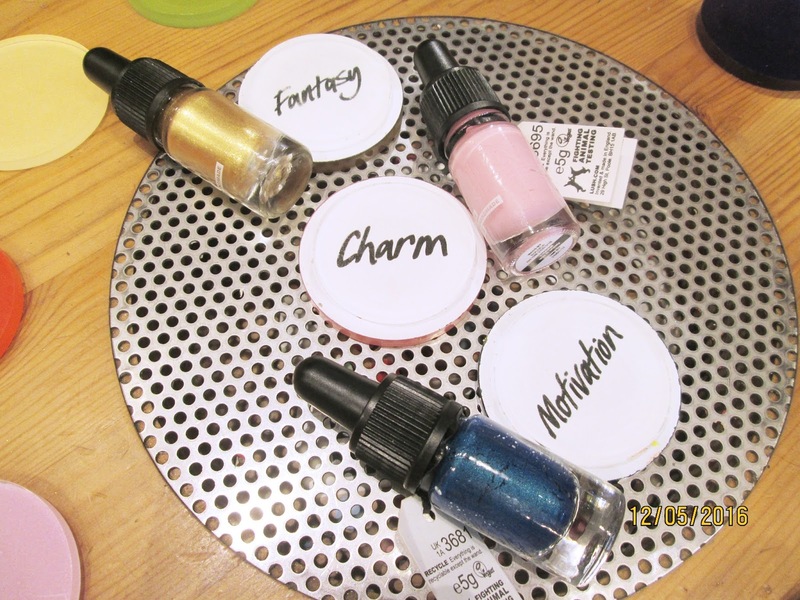 After swatching Fantasy I am now determined to get my hands on it as it is the most gorgeous, glittering gold which makes for a fab liquid eyeliner or eyeshadow base. I was incredibly excited to try the refreshments on offer as I have never had vegan food before, despite Sam's mum being vegan (but we won't get into that). I adored the hummus and thought it was absolutely delicious, and the beautifully decorated vegan cupcakes went down a treat as well. Despite not liking wine, I really liked the apricot wine that was also on offer. The lovely assistant Becki told me how all the refreshments were from local businesses, which I think is a wonderful thing that LUSH supports. We were helped by Sye, the funniest assistant ever who had perfect red eyeshadow and a fabulous beard. He was so quirky and funny as he explained how to make the Butterball bath bombs, and his passion really came accross as he told us how the Cocoa butter was ethically sourced from Colombia, paying better-than-Fairtrade prices. I couldn't resist taking a selfie with him and he gave me a huge hug at the end of the night. My Butterball came out really well, albeit a little wonky, whereas Sam's fell apart a little bit. Oops. At the end of the night I was delighted to receive a custom knot-wrap filled with treats, made by the beautiful Samm (not my boyfriend, the LUSH assistant!) She asked me for details on my hair type and condition before recommending me the same shampoo she uses (we also both have blue dip dye!) which is Jason And The Argon Oil solid shampoo, which I'm really excited to try as I've never used solid shampoo before. 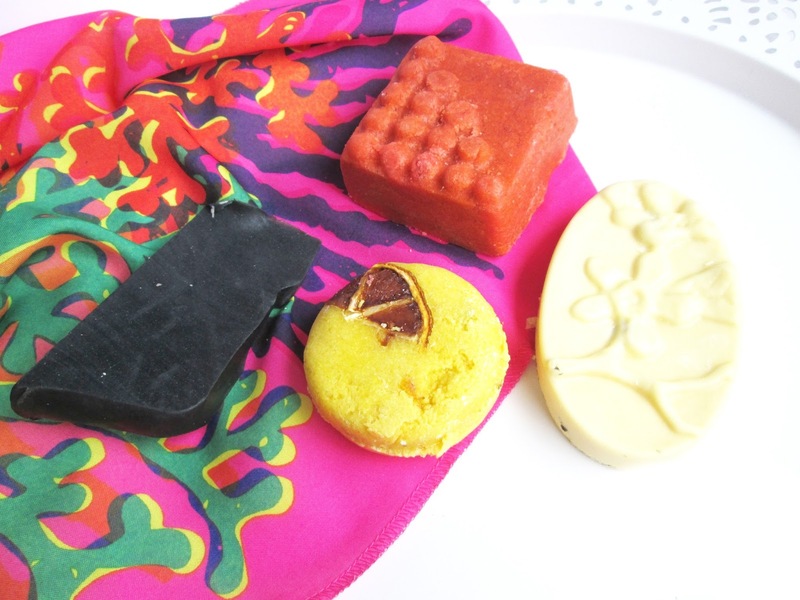 In my knot wrap I also chose a Buffy body butter and scrub bar and we were all given an Each Peach massage bar. 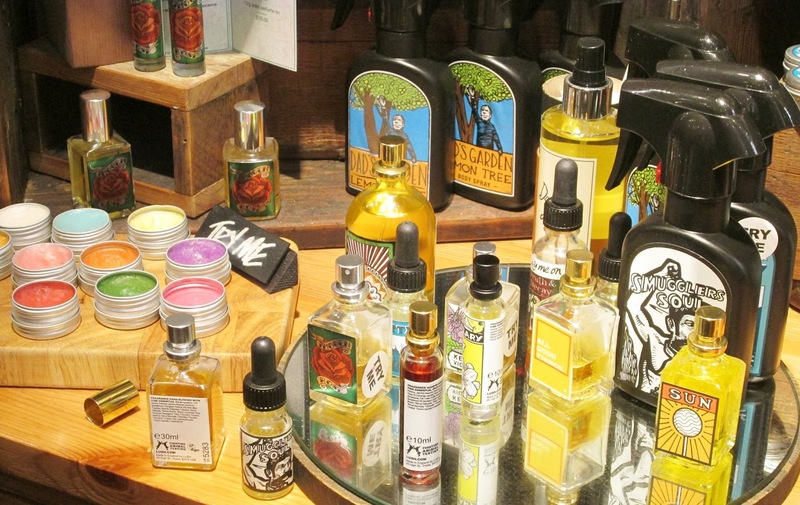 I was totally thrilled to also be able to choose some Coalface facial soap, as my intent was to purchase some anyway. Once again, I was amazed at the generosity and kindness of the staff and LUSH Sheffield when they asked if my boyfriend would like a goodie bag as well. I know what you're thinking - double products for me - but that really isn't the case as he's as big a LUSH fan as I am! 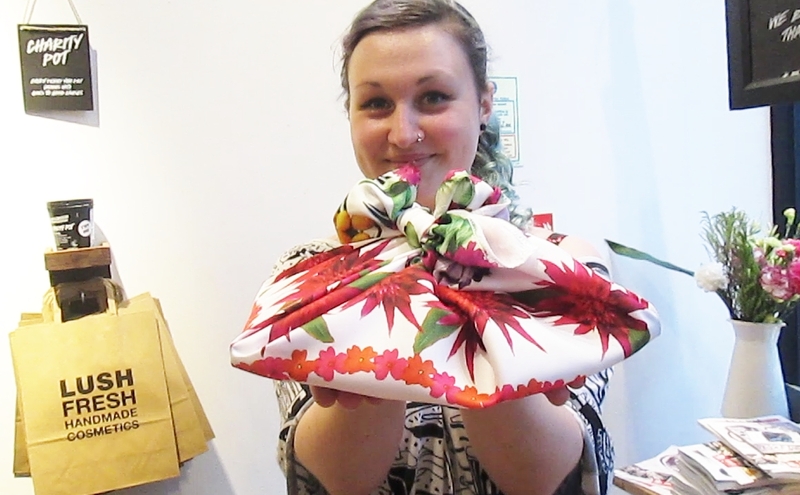 I videoed Samm tying the lovely Pretty As A Picture knot-wrap using a Japanese technique called Furoshiki, however blogger won't let me upload it! So here's just a screen grab of her looking completely adorable as she gave it to me. Lastly, I decided to make some fabulous purchases. I've been wanting to get my hands on Cup O' Coffe for absolutely agessss and was so glad I was able to last night. I also wanted to get a present for my sister, and Becki recommended Ultrabland for sensitive skin with acne due to it containing rose water. I had a truly amazing time at the LUSH #HappyAndHandmade event and I would love to thank Becki, Gabi, Fi, Sophie, Samm and Sye for being so warm, generous and funny all night. Glad to hear how much fun you had! 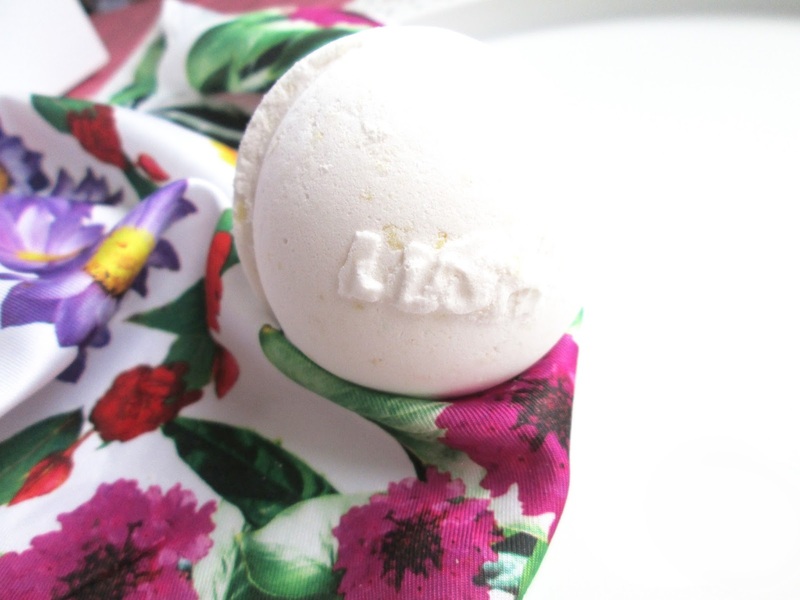 I've used and loved Lush for years and whenever I read posts about these events they always sound awesome! Glad you had a lovely time! It looks like you picked up some goodies too. Oh that sounds so fun! 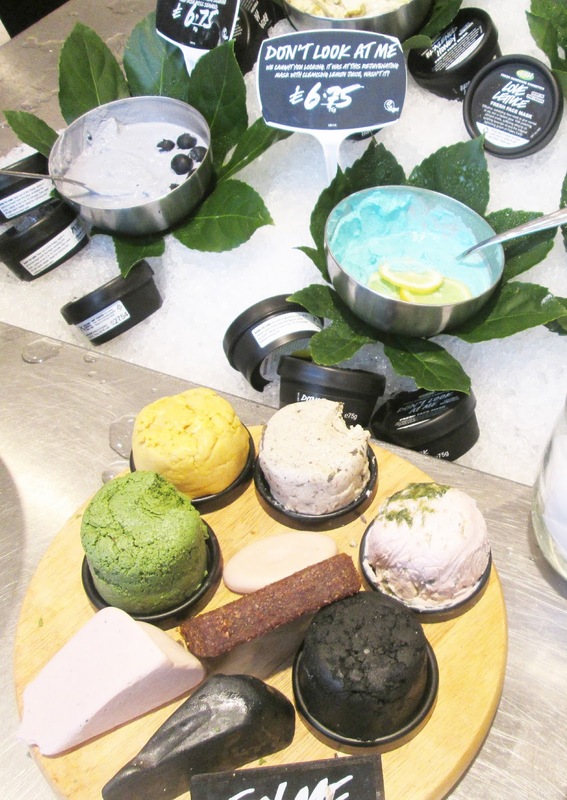 My first blogger event was at Lush and I wrote about on my blog here: http://www.theprintedparade.com/lush-us-self-love/ it was so much fun! Lush is always my favourite place! I'm planning on doing a haul soon!